Traveling along the eastern side of the Sierra Nevada last Wednesday, I glimpsed this scene and thought it will make a nice conceptual image. Interesting to see this next to the picture of windmills. Aesthetically, I prefer the windmills! But I probably wouldn't be looking at this picture without the use of structures like this. On a different level, the framework is an interesting study in engineering, I suppose. The mountains are, of course, beautiful. A thought -provoking photo. Thanks for your thoughts, Cynthia. 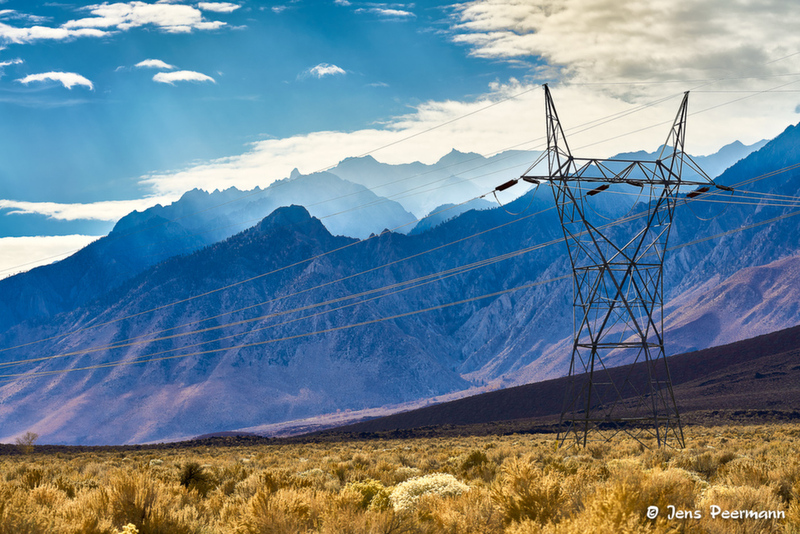 As I said in the caption, this is a conceptual image that is all about energy. And it's not limited to the obvious, electricity, represented by the power lines. The mountains here were pushed up by energy released when tectonic plates crashed into one another; the clouds were formed when thermal energy evaporated water, and then blown across the sky by wind energy; and finally we can also see some rays of sunlight, which is the mother of all natural energies we can utilize on this planet. That's why I chose the title "High Energy". That's really ingenious- I wouldn't have thought of it quite that way. I guess I was influenced in part by the juxtaposition of this "energy" photo with the windmills. So many ways to see this- very cool!